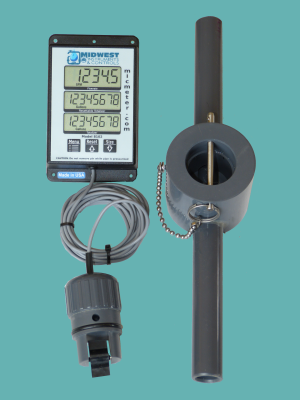 An economically priced paddle wheel flow meter with Remote Display designed for use in various water monitoring fields. These meters have found widespread use in applications such as agricultural irrigation, aquaculture, paper mills, aquariums, koi ponds and swimming pools to name just a few. This remote display series of meters are utilized when the sensor location isn’t easily accessible or viewable. A cable, up to 15′ in length, separates the display from the sensor allowing the display unit to be mounted at eye level. The sensor assembly is waterproof, the remote display unit is sealed, however it can not be mounted underwater or in direct sunlight. 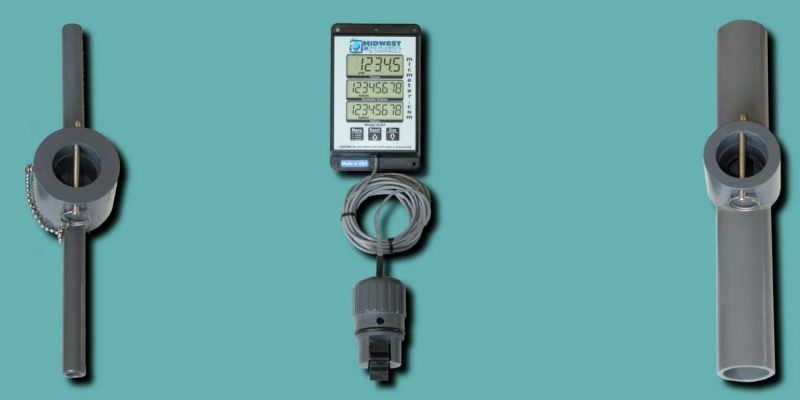 The paddle wheel flow meter with remote display, when used in conjunction with the appropriate adapter, can monitor flows in pipes ranging in size from ½” to 8”. The paddle wheel flow meter is universally accepted as a means of measuring flow. Wide range in flow rates, negligible head-loss and good accuracy at a reasonable price, continue to make these meters popular. Easy removal for cleaning permit the meters to be mounted in lines with moderate particulate levels. The LCD display consists of 21 large digits (1/2″ height). The digits are always displayed and easy to read in low light settings. Contained within the display unit are two replaceable standard AAA batteries that will power the meter for approximately 2 years. A magnet, contained in the paddle wheel, activates a sensor once per revolution. The time it takes the paddle wheel to rotate, divided into the diameter of the pipe, results in the flow rate. A digital averaging algorithm is used to minimize the flow rate variations. The flow rate, a resettable and a non-resettable totalizer are simultaneously displayed. An operator can select the pipe size and schedule from a list using the three embossed buttons on the face of the meter. Default units are gallons/minute and gallons. For sizes not listed, the user can calibrate the meter using a factor derived from the inside diameter of the pipe. Liters and cubic feet are also options. For more detailed information the instruction manual can be downloaded. The paddle wheel and associated parts are injection molded from PVC plastic, the paddle pin is stainless steel. The Buna-N O-ring can be replaced with Viton as an option. An ABS enclosure houses the electronics and a scratch resistant polycarbonate faceplate with embossed buttons completes the package. 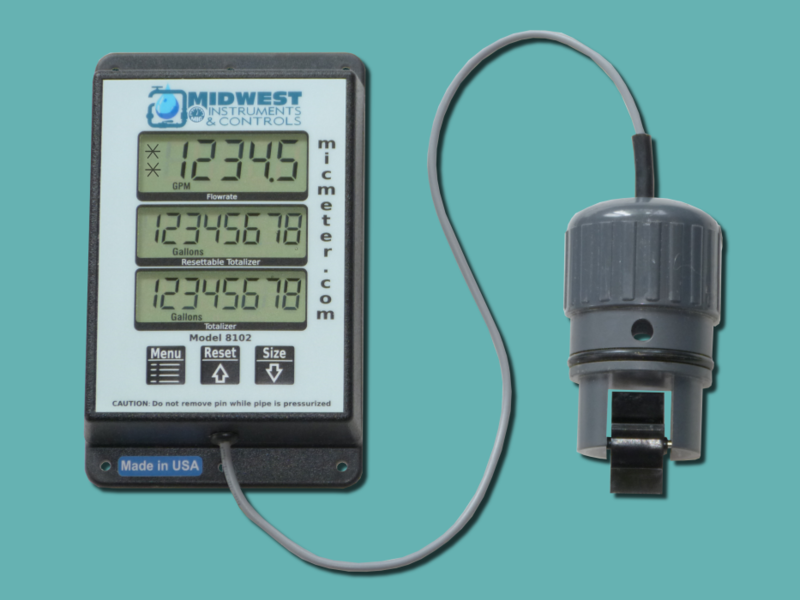 Consider these attractively priced, easily installed meters when choosing your next paddle wheel flow meter. Please call(715-523-1268) or email (info@micmeter.com) for specific application questions. 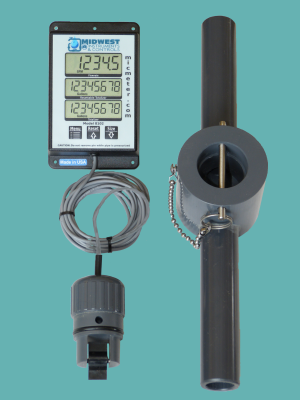 Pipe mounted flow meter with Remote Display supplied with a 13" long section of ½" schedule 80 PVC pipe. Compatible withTell me More! 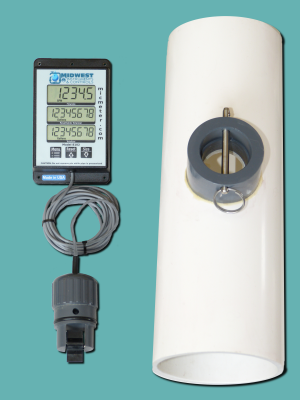 Pipe mounted flow meter with Remote Display supplied with a 13" long section of ¾" schedule 80 PVC pipe. Compatible withTell me More! 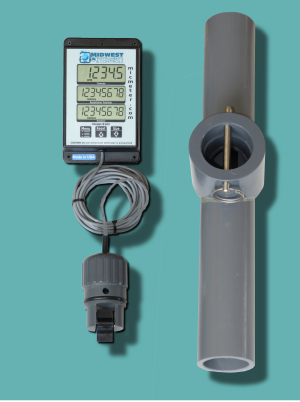 Pipe mounted flow meter with Remote Display supplied with a 13" long section of 1" schedule 80 PVC pipe. Compatible withTell me More! 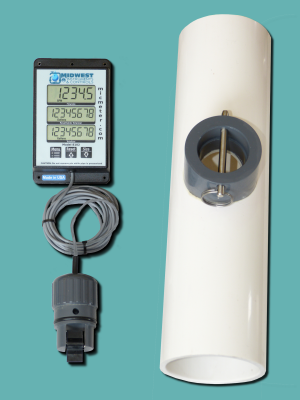 Pipe mounted flow meter with Remote Display supplied with a 13" long section of 1½" schedule 80 PVC pipe. Compatible withTell me More! 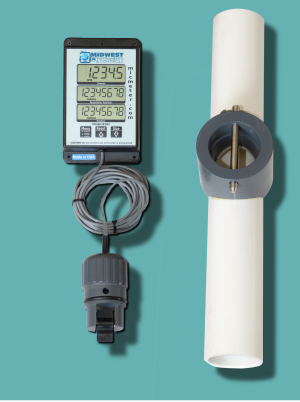 Pipe mounted flow meter with Remote Display supplied with a 13" long section of 1.½" schedule 40 PVC pipe. Compatible withTell me More! 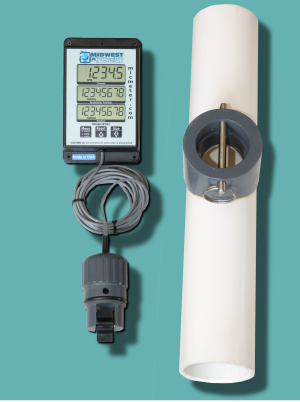 Pipe mounted flow meter with Remote Display supplied with a 13" long section of 2" schedule 80 PVC pipe. Compatible withTell me More! 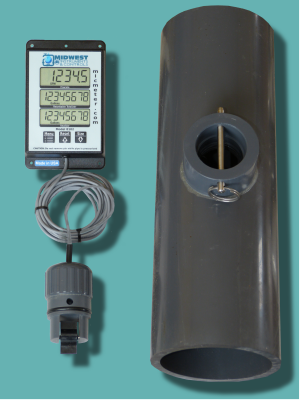 Pipe mounted flow meter with Remote Display supplied with a 13" long section of 2" schedule 40 PVC pipe. Compatible withTell me More! Pipe mounted flow meter with Remote Display supplied with a 13" long section of 3" schedule 80 PVC pipe. Compatible withTell me More! 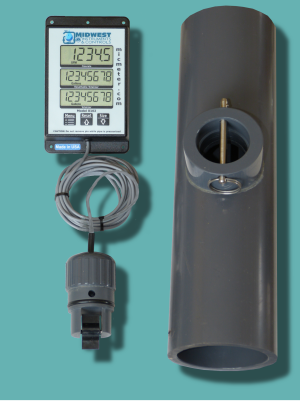 Pipe mounted flow meter with Remote Display supplied with a 13" long section of 3" schedule 40 PVC pipe. Compatible withTell me More! 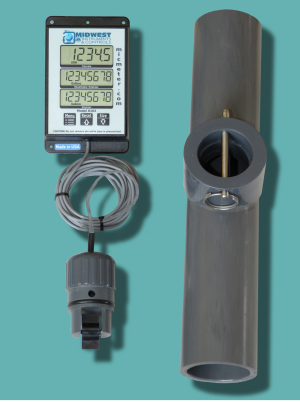 Pipe mounted flow meter with Remote Display supplied with a 13" long section of 4" schedule 80 PVC pipe. Compatible withTell me More! 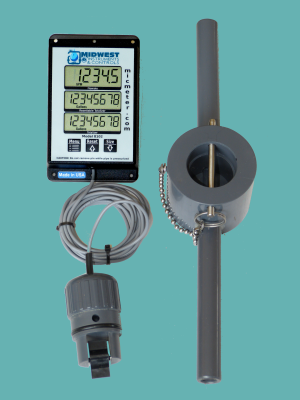 Pipe mounted flow meter with Remote Display supplied with a 13" long section of 4" schedule 40 PVC pipe. Compatible withTell me More!